Although Valentine’s Day is centered around packaged chocolate muscle men, colorful sweethearts, and pink frosting-topped cupcakes galore, it’s time to start making heartfelt treats from scratch for your significant other and/or loved ones. Get rid of the artificial chemicals and sugars that go into making V-Day so sweet and use whole, low-sugar ingredients such as cacao, fresh fruit, raw desserts, and especially peanut butter. If you choose to make your own V-Day treats, it’s important to use healthy, wholesome ingredients that provide nutritional benefits. When you can find a natural peanut butter like Crazy Richard’s with only one ingredient, you can feel safe using it for any and all kinds of sweet treats, including straight out of the jar with a spoon. Another way to avoid a sugar-high during this special holiday is to politely request your loved ones to refrain from giving you candy, that is if you typically receive a gift, and instead, request something non-food related. Seem a little ridiculous? You’ll thank me once you’ve successfully bypassed (pun-intended) all of the overly consumed artificial sweet treats that Valentine’s Day has to offer. 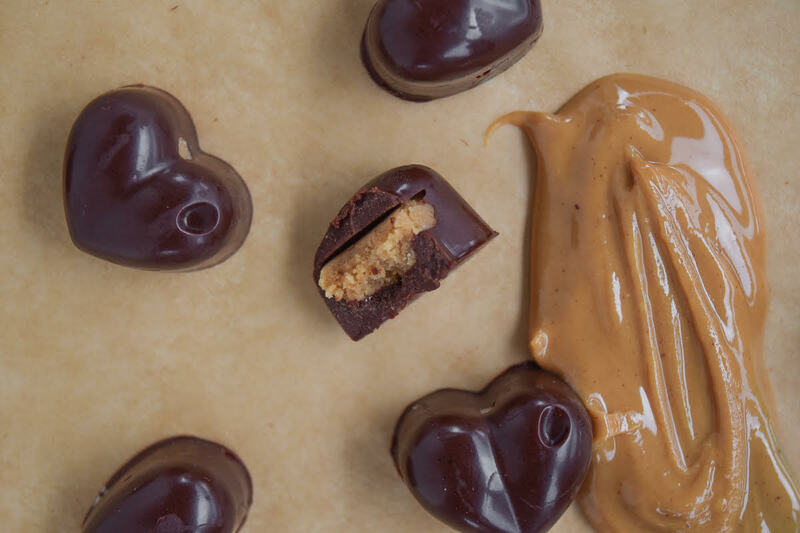 Try making the low-sugar recipe below this Valentine’s Day using Crazy Richard’s Peanut Butter! Melt coconut oil over the stove or in the microwave in a small bowl for 20-30 seconds. After, stir in cacao powder and 1 tsp maple syrup until thoroughly combined. Using a teaspoon measure, pour a very small amount of chocolate mixture into the heart-shaped mold to cover only the bottom. Once all bases are filled, place mold in freezer on a flat surface for 5-10 minutes. Prepare filling: mix together ½ tbsp maple syrup, vanilla, remaining coconut oil together in a bowl. Add in coconut flour to combine, then fold in Crazy Richard’s Creamy Peanut Butter. Remove the heart-shaped mold from the freezer. Then, using a small spoon place enough of the filling mixture to cover the middle of the chocolate base, but leaving enough room around the outside for the liquid chocolate to fill. Once all of the hearts are topped with the filling, use a teaspoon to pour the liquid chocolate mixture over the top of each peanut butter ball, until it reaches the surface of the mold. Place entire mold in the freezer again for 15 minutes to harden. Once done, pop the chocolates out of the mold and enjoy right away or, store in a glass tupperware in the freezer for up to 2 months.